Hi guys, I'm back, as promised. I have a fairly busy weekend planned with a fountain pen meeting tomorrow night and a birthday party on Saturday. 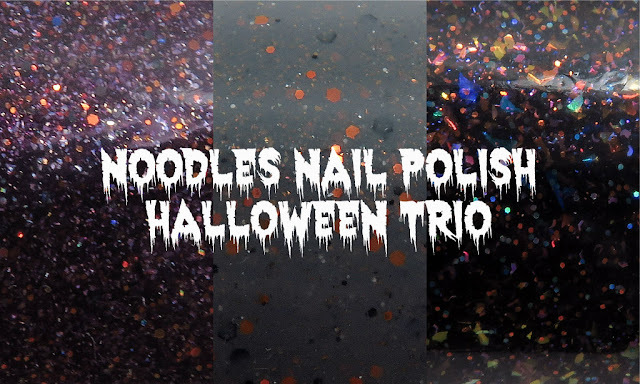 Tonight I've got the Noodles Nail Polish Halloween trio to show you, and if you order, you'd definitely get them in plenty of time for the big day. Natalie is notorious for being a fast shipper, which is great when there's a holiday deadline. But heck, these polishes will be perfect any day, not just for Halloween. The trio will be available next Friday, Sept. 28th at 6 PM EST and will retail for $9.50 each (and will only be available individually). A big thanks also goes out to Jody from JodisPolish on Youtube for picking the names for the set. Without further ado, let's get to the pretties! Those flakes! That glitter! The combination of the 2 is just amazing and complex. Broom Hair, Don't Care is a plum jelly base with orange, silver, and black glitters, silver holo flakes, and peach microflakes. I used 3 thin coats for my photos due to it being a jelly, but I had no issues with the formula or application. It dried with some texture, so make sure to use a topcoat and a peel-off basecoat to make things easier. If you want longevity, skip the peel-off basecoat and just use the foil method for removal. You guys know grey polishes are my kryptonite. When my husband saw Hide and Shriek for the first time he thought the name was Hide and Shnake (a silly way to say snake). It instantly became his favorite thing. Unfortunately, I had to tell him the name was Hide and Shriek, and he decided to continue to call it Hide and Shnake. It wasn't just the name that he loved, but the polish as well. It's currently on his toes. It's a medium graphite grey crelly base with orange flakes, grey/orange/black glitters, and black star glitter. I didn't notice the stars before applying this one, so I didn't get any on the nail. Natalie mentioned that there aren't a huge amount of stars, and that you need to flip the bottle for awhile before applying. The formula was on the thinner side, so make sure not to overload the brush. It was by no means watery, just thinner than some of their other polishes. It was extremely pigmented, so I needed just 2 coats for my photos. Little Black Spellbook is a black crelly base with orange/pink/gold and blue/purple/pink shifting flakes, and orange/purple microglitters. The orange and blue flakes are the most obvious colors on the nail. I love the depth the flakes add to this one. I used 3 thinner coats for my photos, and it was extremely easy to apply. Depending on your coats and length of your nails, you may be able to get away with just 2. What a unique set of polishes! I honestly don't think I have a favorite of the lot. I absolutely adore all 3 of them. If you asked my husband, his favorite is definitely Hide and Shnake 😂 I mean Hide and Shriek. Again, these will be available next Friday, Sept. 28th at 6 PM EST for $9.50 each. You can find out more about Noodles Nail Polish on their website, Instagram page, Facebook page, and Facebook Fan Group.